Next time you find yourself asking God why He has not answered you, think about these verses. It could be He is protecting you from a dangerous situation, or it could be it’s not the time yet. Trust in the One who sees the big picture and has your best in mind. Our family moved from Puerto Rico to Georgia in 2011. 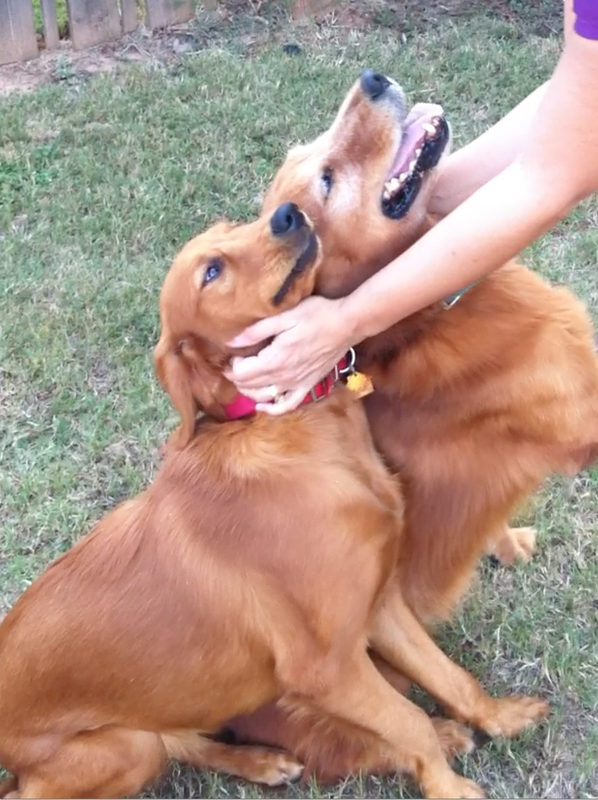 With our move, we also brought our golden retrievers, Watson and Pennie. Watson was seven years old, and Pennie was a 6-month old puppy. On our second week in Georgia, they escaped during the night. In Puerto Rico, they were used to sleeping in the backyard, which had a large and open terrace, with roof and floor tiles. So when we moved, since it was still summer, they stayed in the backyard at night, as usual. I heard Pennie barking and howling past midnight, but I did not hear Watson. I opened the backdoor and saw that she was all right, so I went back to bed. I did not hear her howling or barking anymore. When we woke up in the morning, I went outside to call the dogs, and to my surprise, they were not there! My husband was on a business trip, and my children were desperately looking for the dogs. Watson’s collar had a tag with our phone number, but he was not wearing it at the time; I found it thrown on the ground. It was time to go to school, so I promised my son and daughter I would look for the dogs. I searched and searched in the nearby neighborhoods asking people if they had seen them, until I visited a veterinary clinic to check if someone had found our dogs. The receptionist grabbed a flyer and asked me “is this your dog?” A lady had found Watson and distributed flyers in different places! I was so relieved and then proceeded to ask for Pennie. The flyer only mentioned one dog. Then, I recalled her howling in the middle of the night. Watson had probably escaped first, and when she found herself alone, she went after him. I got nervous because she was just a puppy. I called the number on the flyer and coordinated with her daughter to pick up Watson in the afternoon. I thanked them for rescuing him. On the other hand, we couldn’t find Pennie that day. My daughter was devasted. So my husband decided to put a pet amber alert. During the following days, I received different calls from people I met and from organizations, asking if I had found the puppy. I kept making phone calls and looking around. We prayed every day for the dog to be found. One morning, before my children went to school, I recalled a similar event recorded in the Bible. Saul was looking for his father’s donkeys; this occurred before becoming the first king of Israel. At the third day, the Prophet Samuel invited him to have dinner and told him not to worry about the donkeys, which “had already been found.” You can read this story here, https://www.bible.com/bible/111/1SA.9. So, I told my son and daughter, “We don’t know where Pennie is, but God knows. At the sixth day, while I was doing some errands, I received a call from another veterinary clinic (I had gone to several). The lady on the phone said with an exciting voice, “your dog has been found.” Tears of excitement filled my eyes; I asked for the address and went to pick her up. Then, I immediately called my husband to give him the good news. A mom with her three kids found Pennie on the street. They took her home and cared for her that night. At my arrival, the employees came to the front to watch the encounter. They even volunteered to take pictures, which I sent later to my husband and children. Hope and trust in the Lord is all we need in times like these.